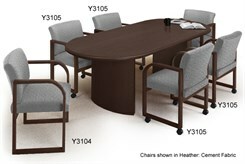 Solid Oak Conference Tables with Split Base! Nothing stands the test of time quite like solid oak. 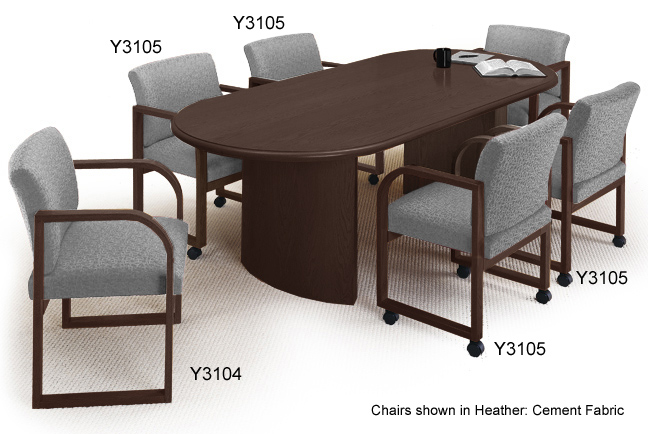 Made right here in the USA, these quality conference tables will last beautifully for years to come. Hand stained in your choice of 6 colors. 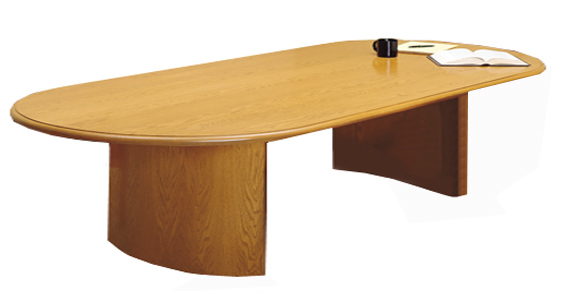 72" x 36" Solid Oak Oval Racetrack Conference Table sold above. Other sizes and chairs sold separately below. All tables tops are 1" thick with 1-5/8" bullnose edge treatment. Curved bases can be arranged concave or convex. No seams! All table tops are one piece. 36" x 72" table seats 4-6 people. Stands 29-1/2"H. Ships unassembled. Shpg. wt. 98 lbs. PRICE INCLUDES SHIPPING! (Truck shipment - see Terms & Conditions). Please allow 3 weeks for delivery. Domestically made, hand stained solid oak table will provide you with years of dependability. 1" thick table top with 1-5/8" bullnose edge treatment. 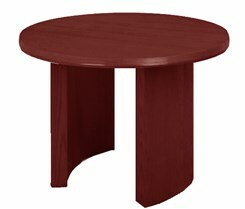 Curved bases can be placed either concave or convex. One-piece top. Seats 6-8 people. Table stands 29-1/2"H. Ships unassembled. Shpg. wt. 142 lbs. PRICE INCLUDES SHIPPING! (Truck shipment - see Terms & Conditions). 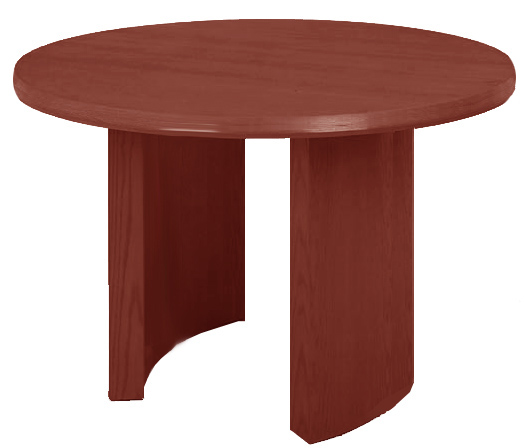 Domestically made, hand stained solid oak table will provide you with years of dependability. 1" thick table top with 1-5/8" bullnose edge treatment. 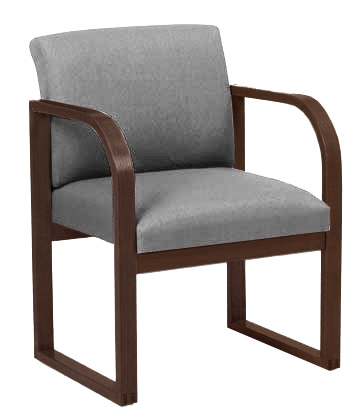 Curved bases can be placed either concave or convex. One-piece top. Seats 8-10 people. Table stands 29-1/2"H. Ships unassembled. Shpg. wt. 195 lbs. PRICE INCLUDES SHIPPING! (Truck shipment - see Terms & Conditions). Quality, 48" diameter solid oak conference table seats 4 people max. 1" thick table top with 1-5/8" bullnose edge treatment. Curved bases can be arranged either concave or convex. Ships unassembled. Shpg. wt. 90 lbs. PRICE INCLUDES SHIPPING! (Truck shipment - see Terms & Conditions). Quality, 42" diameter solid oak conference table seats 3 people max. 1� thick table top with 1-5/8" bullnose edge treatment. Curved bases can be arranged either concave or convex. Ships unassembled. Shpg. wt. 75 lbs. PRICE INCLUDES SHIPPING! (Truck shipment - see Terms & Conditions). 1 - 5 $259.00 ea. 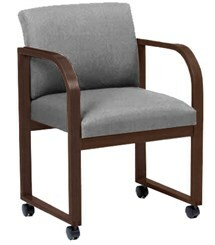 Like the chair shown above but with four casters for easy mobility. Solid oak frame and no-sag matrix seat support system. 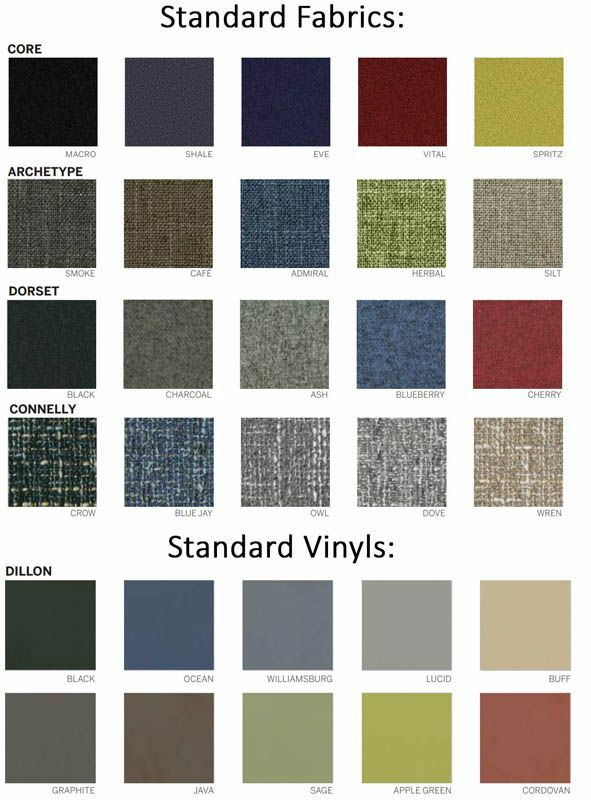 Available in 15 fabrics and 6 frame finishes, see swatches above. Easy "no tool" assembly! Shpg. wt. 32 lbs. PRICE INCLUDES SHIPPING!